Given my penchant for pink lipstick, there was no doubt in my mind I needed this sparkly sequin lips sweatshirt from Forever 21. I first saw it in November, but it was sold out. I gave up that it would hit the store again…but right before Christmas, it popped up again. Besides for it being doused in sequins, I like the fact that while it’s a sweatshirt, it can go casual for dressy. A shirt this sparkly deserved to be paired with other bold, bright and ridiculously pink accessories. By the way, it was so stupidly, obnoxiously cold when I took these photos. Well, it’s been this way in New Jersey for two weeks. We hit 9 degrees the other day… so yeah, I’d say that puts a damper on taking photos outside. 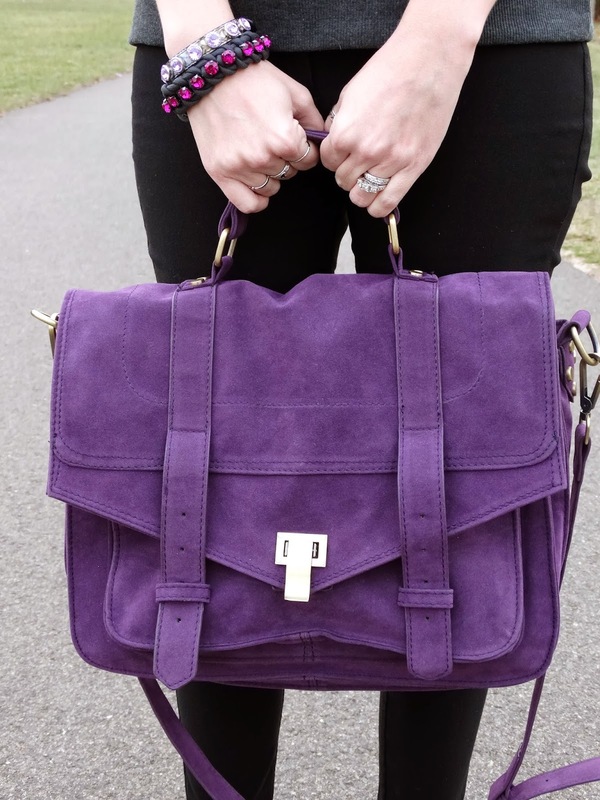 It would appear that I’m on some type of a shopping roll, since I also scored this purple satchel from Poshmark! This was another one of those blink and you missed it styles that I held out hope on finding. Reunited… and it feels so good. Don’t forget to check out the Indie and Rocker Chic Posh Party I’m hosting on Poshmark this Tuesday!